Villa Michelle has a gated driveway and substantial mature garden area to the front. The property has four bedrooms and three bathrooms. The master bedroom benefits from air conditioning and has a double bed, dressing room with wardrobe, drawers and mirror and a spacious, fitted ensuite bathroom. The bathroom has a corner bath, with a separate show over and double sink unit. Bedroom two has a double bed, fitted wardrobe and dressing table. Bedroom three has twin beds, fitted wardrobe, drawers and mirror. There is a large shower room located between bedrooms two and three. Bedroom four has a single bed, bunk beds and a futon style sofa bed. There's a set of drawers and a dressing table. This bedroom has a fitted ensuite shower room. The kitchen is well equipped and features an oven, hob, microwave, fridge-freezer, dishwasher, washing machine and numerous wall and base units. The kitchen surfaces are finished with lovely granite worktops and there is also a breakfast bar and air conditioning. The kitchen opens on to the large living room which has a three piece suite plus built-in seating. There is satellite TV, a DVD player and a CD player. The patio doors open onto a very large terrace with a covered pergola providing a lovely al fresco dining area which has lighting, a large BBQ and a sink. 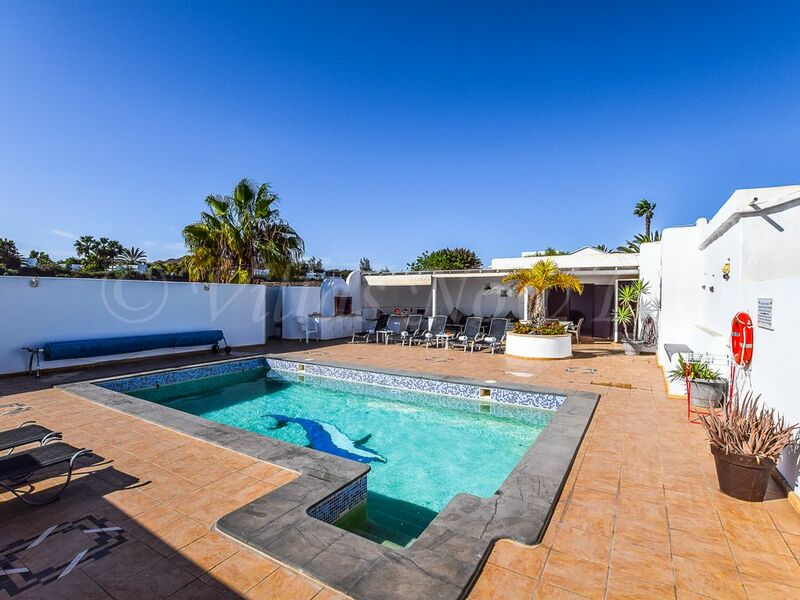 There is a good sized heated pool with seating for 10 people and 8 sun loungers. A lower covered terrace has a pool table with lighting. The terrace is walled and gated and therefore very private. From the terrace you have a great view to the harbour and can sit and watch the ferries going back and forth from Fuerteventura. *** Highchairs, cots and child seats *** These are available for hire at €25 a week, per item. We do not provide linen for cots in case of allergies in small children. A mid-stay clean including a change of bedding and towels is provided for all bookings in excess of 12 days duration. Beach towels are not provided. 1. Rates are based on 4 people. Please add an additional £105per person per week up to a maximum of 9 people. 2. For your comfort from 1st&nbsp;October to30th&nbsp;April use of the electric pool heater is FREEand will give an approximate water temperature of between 26º to28º C - weather dependant. If you would like additional poolheating during the summer months, please add an additional £85 perweek. 3. Cots and highchairs are available to rent from a localcompany. They can be pre-ordered and waiting for you at the villaon your arrival. These cost €25 per item per week payable onarrival. PLEASE NOTE: If you are travelling with a small child, wedo not provide bed linen for cots due to the sensitive nature of achild's skin and the risk of allergies. 4. All holiday bookings are subject to a 5% service fee. Adeposit of 15% of the total holiday price must be paid before theholiday booking can be confirmed. The balance of the holiday priceis to be paid via Credit/Debit card or Bank Transfer and must bereceived at least 8 weeks before the holiday start date. 5. PLEASE NOTE: We ask for a standard £400 REFUNDABLESECURITY DEPOSIT on any booking to cover damage that may occurduring your stay. This is payable either in cash on arrival or viabank transfer two weeks before your holiday starts. However, wehave a "BREAKAGES INSURANCE POLICY" in place and for a small fee of£7.50 per guest, per booking (non-refundable) your party will becovered for the first £500 of any damage caused and negate the needto pay a security deposit. 6. Unlimited WiFi access is FREE.